RUSH: When we left the program yesterday, the bridge at Florida International University had collapsed only moments ago. There was still some confusion being reported. The way it was being reported, I thought the bridge was open. The bridge wasn’t open. The span had been put in place on Saturday. The bridge not supposed to open ’til early next year. At any rate, the left has already found a way to politicize this. The left has already found a way to incorporate the name Donald Trump into the assignation or the assignment of blame. When, in fact, the culprit here — if we want to go there, since they opened the politicization door. The real culprit here is a new way of construction and awarding contracts created by — dadelut dadelut dadelut dadelut dadelut! — Barack Obama. RUSH: Now, about this bridge. 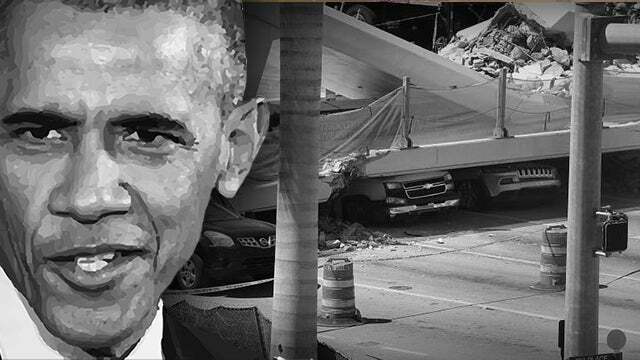 The left has already found a way to politicize the bridge collapse at Florida International University. Within minutes of the news that bridge had come down, there were comments on Twitter (which have now found their way into the mainstream) asking, “How can we waste money on Trump’s wall when we have infrastructure problems like this? How can we possibly be thinking of spending money on a wall when we’ve got problems with our infrastructure? We need infrastructure spending first! “We don’t need to build a wall. It’s a sign of how Trump’s priorities are all out of whack.” Well, since they’ve opened the door to politicizing this — and they always do. You can count on it. They politicized the shooting at the school in Parkland. They continue to politicize these kids walking out of school. They politicize everything in service of the advancement of their agenda. The Miami Herald reported: “A pedestrian bridge under construction collapsed Thursday, just days after crews had dropped an elevated 950-ton span in place on a signature project that was intended to give Florida International University students a safe way across the busy roadway. The $14 million project was partly federally funded” through Obama’s TIGER program. Have you ever heard of the TIGER program? It stands for Transportation Investment Generating Economic Recovery. The TIGER program, kind of like the Affordable Health Care Act. There was nothing affordable about Obama’s health care act. Transportation Investment Generating Economic Recovery. Still reading from the Miami Herald: “The 174-foot, 950-ton section of the bridge was built adjacent to Southwest Eight Street using Accelerated Bridge Construction (ABC) methods, which are being advanced at FIU’s Accelerated Bridge Construction University Transportation Center (ABC-UTC).” Are you keeping up with all this? We have the Accelerated Bridge Construction University Transportation Center. So ABC-UTC. Now, “‘[t]his method of construction reduces potential risks to workers, commuters and pedestrians and minimizes traffic interruptions. The main span of the FIU-Sweetwater UniversityCity Bridge was installed in a few hours with limited disruption to traffic over this weekend,’ said the press release.” Yeah, it went up quickly; it came down quickly. Mark Rosenberg, the president of the university said, “I have not spoken directly to Munilla Construction, but I am satisfied that the testing that was occurring was consistent with best practices. I’m not an engineer, so I’m not privy to those details. I know that tests occurred today. And I know, I believe, that they did not prove to lead anyone to the conclusion that we would have this kind of a result.” Of course not. Why would they put it up if they thought this was gonna happen? So what do we have here? We have a bridge that went up. We have a bridge that came down. We have TIGER Obama administration funding. We’ve got new engineering text that survived a bunch of testing but didn’t survive reality. It’s all done to supposedly speed up the building and implementation of these projects, yet this bridge, a pedestrian bridge over roadway took five years? The Empire State Building was built in five years! The Golden Gate Bridge was built in five, this is a pedestrian bridge and they’re proud that they built it in five years, and it still didn’t stand. Obama had to prove his infrastructure program was working, don’t you know? Now we have claims that with this kind of accident, we can’t afford to have any money spent on the wall. Why, this is clearly obvious to so many people. We just can’t escape these people politicizing virtually everything. It doesn’t matter who dies, how many people die. Everything has to have a political component. And if these people have their way, Republicans or conservatism are gonna get blamed for all or part of every one of these incidents. RUSH: “Construction Firms Behind Collapsed FIU Bridge Faced Accusations of Unsafe Practices.” This is from the Miami New Times. 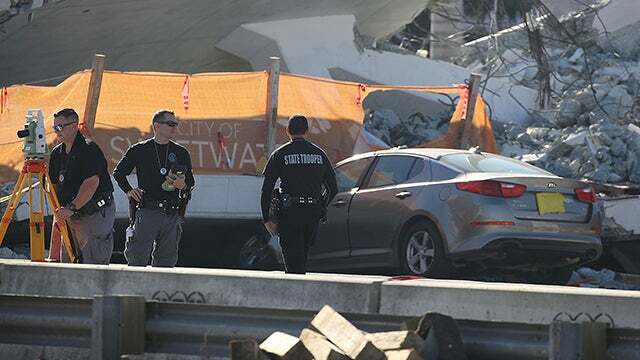 “Two of the biggest firms that built the Florida International University pedestrian bridge that collapsed today have recently been accused of unsafe practices. In one of those cases, another bridge project toppled onto workers. “Munilla Construction Management, a South Florida firm, beat out three other finalists to win the bid to build FIU’s bridge, which was part of a $14.2 million project funded by the U.S. Department of Transportation,” in the TIGER Program. The $14.2 million bridge was designed to withstand a Category 5 hurricane, the most dangerous measure by the National Hurricane Center, and built to last 100 years. Well, not quite. Not quite.